Skyhook was always a cool Superman villain, and one that wasn't used very often. 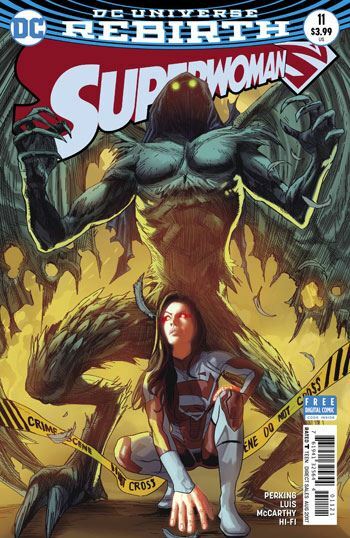 I am glad to see him back, in all his child kidnapping creepiness, in the latest issue of Superwoman. But I cannot say that I am really overwhelmed and excited about the issue itself. There are some really good things in this story. The art is excellent throughout. I enjoy delving into the backstory of Steel's nephew, kidnapped long ago by Skyhook, and the boy's shady father, the reason for the incident. I like the emotional rifts that devleop between John Henry Irons and his brother, as well as between John Henry and Lana before the issue is out. The scenes with the Atomic Skull are really entertaining. The character is being used much better than he has been in years. There are really only two things that bother me about the issue, but both severely impacted my enjoyment. First of all, Maggie Sawyer has a scene with Lana Lang, who is trying to get information about Skyhook and the kidnapping. At no point in their talk, not once, does Maggie make reference to the fact that her own daughter had been kidnapped by Skyhook. Considering that Maggie is addressing a parental-ish concern on Lana's part, it would be more than natural for Maggie to bring this up, to show that she understands where Lana is coming from. Perhaps with all the reality shifts Maggie's daughter was no longer a victim of Skyhook. Fine. But then that should be made clear as well, some line of dialogue indicating that. The second problem has to do with Lana in her amped up Superwoman costume. During her spat with Steel and Natasha Lana is basically accused of shirking her duties as a super hero. And yet, as the climax of the story makes clear, Lana's Superwoman costume can be rendered useless simply by the presence of magnets. That's one major design flaw. With a crappy working suit like that, would anyone seriously demand that a person put it on and go out to risk their life? The previous issue of this book was somewhat disappointing, and this one has not allayed my concerns. 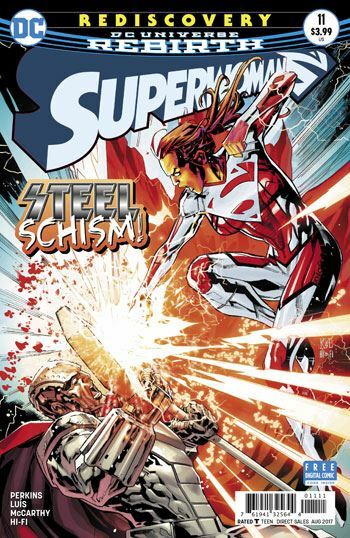 Superwoman just ain't so super anymore.